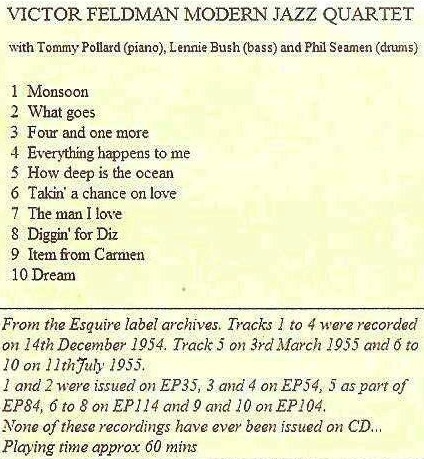 Tommy Pollard plays vibes on the All Star Sextet LP above, the only recordings he made playing vibes. The CD on the right is a compilation of the EPs made by the Victor Feldman Modern Jazz Quartet. Feldman is on vibes throughout with Pollard on piano. (None of this music has ever been released commercially on CD and has been compiled with the help of visitors to this website from their original vinyl). These and many other "never released" CDs are available from this website via the e-mail link at the bottom of the page.